The signature dish at Billy Kwong restaurant in Sydney is crisp-skinned duck, drenched in what the Australians call a blood plum sauce. However, I have a weakness for meltingly tender squares of pork belly, so I swapped this for the duck and discovered a match made in plum heaven. Pierce the pork all over with the tip of a knife, through the fat but not into the meat, so you make 50 or so slits. Transfer to a wire rack over the sink. Boil a kettle and pour the water over the pork to open up the holes you've just made. Dry with kitchen paper and leave for an hour. When ready to cook, rub the pork with the five spice, sugar, lime zest and chilli. Preheat the oven to 190°C, gas mark 5. Put the pork, on its wire rack, on a roasting tray. Roast for 1 hour. Turn down the oven to 140°C, gas mark 2 and roast for 3 hours more, until the fat is dark brown and crackled. Make the sauce. Place 125ml water, the sugar and spices in a pan and heat gently. Once the sugar has dissolved, turn up the heat and boil for 5 minutes till syrupy. 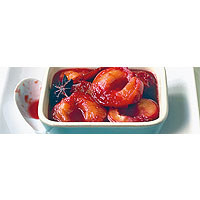 Add the plums and fish sauce and simmer for another 3–4 minutes till the fruit softens and the juices are red. Add lime juice so it tastes quite tart and set aside for the flavours to mingle. Remove the pork from the oven and rest for 30 minutes. Turn the pork, crackling-side down, onto a chopping board and cut into chunks with a serrated knife. Serve 2 or 3 chunks to each person, along with some plum sauce. A fruity red cuts through the porks fat.